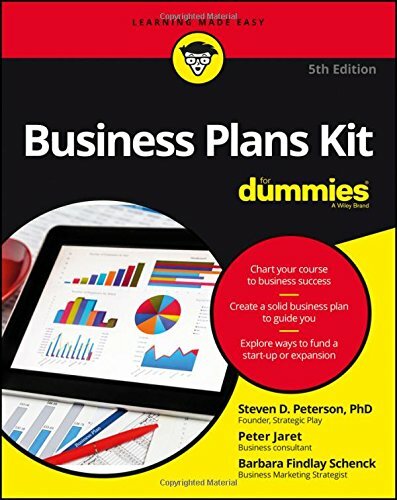 Business Plans Kit For Dummies (E-Book) by Steven D. Peterson, etc. The fast and easy way to construct a winning business planIf you're looking to establish, expand, or re-energize a business, the best place to start is with a sound business plan—and this new edition of Business Plans Kit For Dummies is here to help you get you started. From getting your hands on start-up money from investors to successfully growing or reimaging your venture, it offers everything you need to craft a well-defined business plan that will set you on a course to get your business moving in the right direction. Are you unsure how to draft objectives for managers or deal with displacement? Are you new to hiring employees and need help grasping the ins and outs of creating a new business? No worries! Business Plans Kit For Dummies is brimming with all the tools and expert guidance you need to bring a successful business plan to life and keep your company afloat in any economic environment. Including the latest tips and resources, and packed with lots of helpful examples and sample forms, it offers everything you need to craft a winning business plan and increase the likelihood your business will not only survive, but thrive! If you're a small business owner, investor, or entrepreneur looking for expert guidance on developing and implementing a strategic plan to help your business succeed, Business Plans Kit For Dummies has you covered!